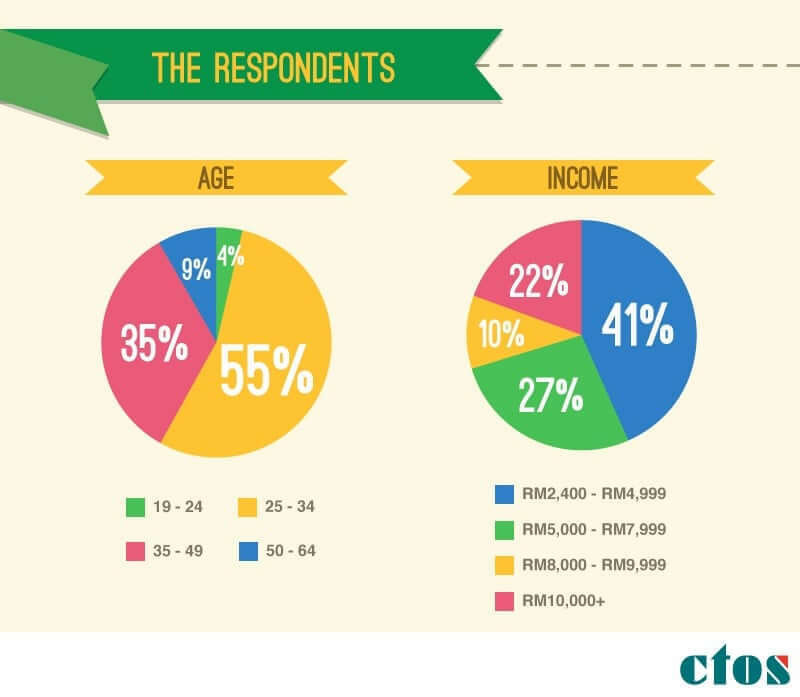 CTOS - Credit Survey: How Well Do Malaysians Know Their Credit? Credit Survey: How Well Do Malaysians Know Their Credit? This article originally appeared on imoney.my, in partnership with CTOS. In the current economic climate, it is increasingly important for the average Malaysians to know about how their credit report works and how the reports can affect their finances – positively and negatively. Have you seen your credit report? Do you know how it works? When was the last time you checked yours? All these questions should be familiar to you because not knowing how your credit report looks like or understanding how it can impact your loan or credit card application can lead to a financial disaster. According to the results from the survey, car loan, also known as a hire purchase loan, is the most popular credit facility among Malaysians. Due to the lack of public transportation infrastructure in many areas in the country, a vehicle has become a must-have for most Malaysians. Unfortunately, car loan is also the main cause of bankruptcy in Malaysia, according to the statistics provided by theDepartment of Statistics Malaysia. We can see why, as the car loan takes up 40% of income, which is dangerously high especially if you have other credit facilities as well. Though it is the most popular credit facility in Malaysia, it is not the first credit facility most Malaysians take up. This could be due to the higher income requirements for hire purchase loan. 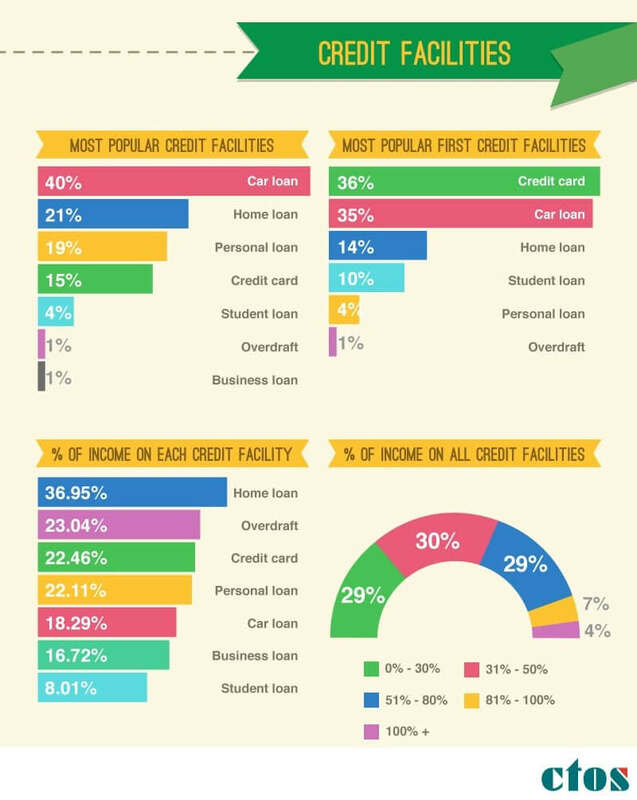 Themost popular first credit facility is credit card. With minimum income requirement as low as RM2,000 a month, credit card has a wider eligible audience, from fresh graduates to even the lower middle income group. 40% of the survey respondents are on the dangerously high side of debt-to-income ratio of 51%and above. This is shocking, as a slight overspending could lead to defaulting of loans by these individuals. Debt-to-income ratio should be monitored and maintained at a healthy level to ensure one is not inundated with overwhelming debts that could lead to a bad credit score and eventually, bankruptcy. 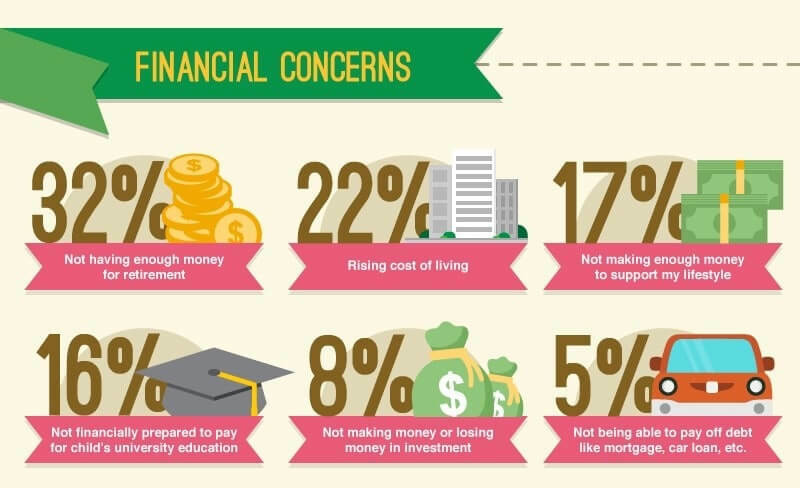 What do Malaysians worry the most about when it comes to finances? With the bleak findings released by the Employees Provident Fund (EPF) in recent years, where half of EPF members exhaust their EPF savings within five years of retirement, Malaysians have become more aware of the importance of their retirement savings. It’s great that Malaysians are aware of and concern about their long-term goals with32% concerned about not having enough money for their retirement, while 22% are worried about the escalating cost of living in the country. With awareness, proactive actions will hopefully be taken by Malaysians to alleviate these concerns. Even with many financial concerns plaguing Malaysians, more than half are still confident about their financial future, while 35% are not confident at all and 11% are not sure. Malaysians seem to be on the right track with 30% of respondents working towards achieving their short-term goals ofincreasing their net worth, building up a sizeable contingency fund (26%) and getting out of debt completely (22%). These are excellent financial goals to focus on in the short-term especially in today’s shaky economic climate. With retirement being a major financial concern for most Malaysians, it is not surprising that34% are working actively to achieve their long-term goals of saving enough for a comfortable retirement. This is important in order to avoid sacrificing on your quality of life in your retirement years. 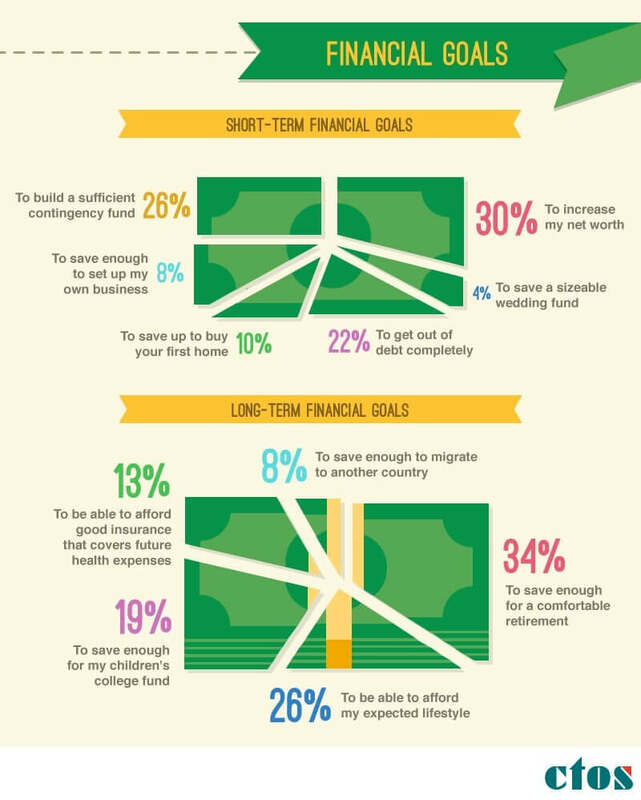 Other long-term goals that are prioritised by Malaysians are the ability to afford the lifestyle that they want (26%), to save for their child(ren)’s college fund (19%), to afford adequate health insurance (13%), while the remaining 8% are saving to migrate to another country. The survey findings also show that Malaysians are aware of where they stand financially and what obstacles they may face in achieving their financial goals. However, the link between these and their credit health is not quite clear for them. More than half (52%) of the respondents are not aware of what does or does not affect their credit report. 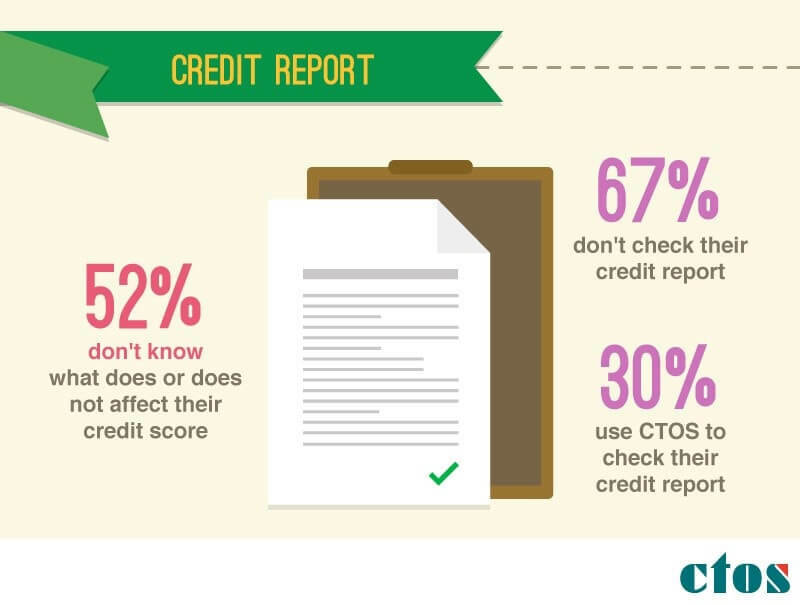 A whopping 67% have never checked their credit report and only 30% know where to check their report. The first step of improving one’s financial health is to identify the problems, and based on the findings from this survey, it seems that Malaysians have made leaps and bounds in financial literacy. However, it is equally important for them to be aware, monitor and actively maintain and improve their credit report for their future financial outlook. Stay tuned as we will be updating the findings regularly!